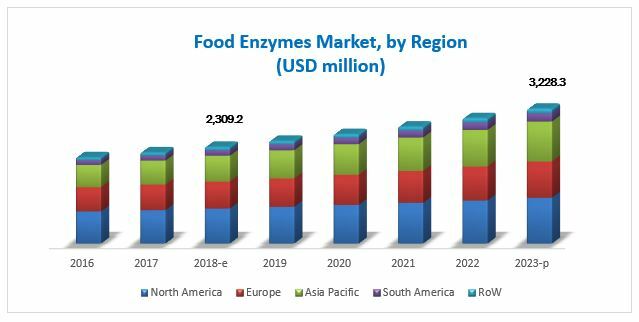 [193 Pages] The global food enzymes market was valued at USD 2.18 billion in 2017; this is projected to grow at a CAGR of 6.9% from 2018, to reach USD 3.23 billion by 2023. This research study involved the usage of extensive secondary sources (such as directories and databases) Hoovers, Bloomberg BusinessWeek, and Dun & Bradstreet (which acquired Avention) to identify and collect information useful for the study of the food enzymes market. The primary sources included several industry experts from the core and related industries and suppliers, manufacturers, distributors, alliances, and organizations related to all segments of this industry’s supply chain. 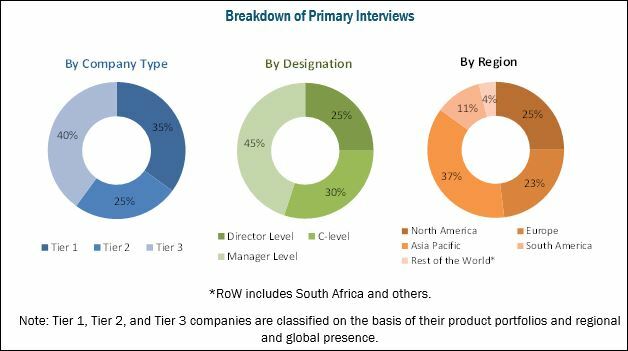 In-depth interviews were conducted with various primary respondents including key industry participants, subject matter experts (SMEs), C-level executives of key market players, and industry consultants to obtain and verify critical qualitative and quantitative information as well as to assess future prospects. The following figure depicts the market research methodology used in drafting this report. The key manufacturers in the food enzymes market include DowDuPont (US), Associated British Foods (UK), DSM (Netherlands), Novozymes (Denmark), and Chr. Hansen (Denmark). These companies have diversified product portfolios and advanced technologies for food enzymes at major strategic locations. Other companies include Brenntag Pte. (Germany), Kerry Group (Ireland), Jiangsu Boli Bioproducts (China), Biocatalysts (UK), Puratos Group (Belgium), Advanced Enzymes Technologies (India), Amano Enzyme (Japan), and Enzyme Development Corporation (US). The food enzymes market is projected to reach USD 3.23 billion by 2023, from USD 2.31 billion in 2018, at a CAGR of 6.9%. The major driving factor for the food enzymes market is high reaction specificity, the demand for environment-friendly manufacturing processes and improved quality of processed food. Based on formulation, the global market has been segmented into lyophilized powder, liquid, and others. The lyophilized powder segment dominated the market in 2018, and this trend is projected to continue throughout the forecast period, from 2018 to 2023. Lyophilization powder is also known as freeze-drying and is widely used due to its advantages. Lyophilized powder is produced using a unique combination of various coating technologies, which results in effective encapsulation of enzymes. On the basis of application, the food enzymes market has been segmented into beverages, bakery products, confectionery products, processed food, dairy products, and others. The bakery segment dominated the global food enzymes market in 2018. The addition of enzymes to the dough improves the bread baking process. Lipase is an enzyme that has recently found increased application in bakery products, as compared to protease and amylase, which have always been used in this sector. Although protease is useful for the dough mixing process and for reducing the processing time, lipase is preferable, as it increases the shelf life of bakery products. On the basis of source, the global market has been segmented into microorganisms, plants, and animals. The microorganisms segment dominated the global food enzymes market in 2018. The major advantages of using microorganisms are a lower cost of production, increased scope of industrial fermentation, simplified production techniques, and speedy culture development. Technological advancements have made food enzymes available for a wide range of applications in the food & beverage sector, which is estimated to drive growth in this region. Companies such as DowDuPont (US) and Archer Daniels Midland Company (US) play a vital role in meeting the growing demand for processed food in this region, which has resulted in the increased demand for food enzymes. Asia Pacific is projected to be the fastest-growing in the global food enzymes market during the forecast period, owing to the rising awareness, market potential for existing products, and unexplored application segments. Restricted temperature and pH operational range are the major restraining factors for the food enzymes market. The action of food enzymes is largely influenced by surrounding environmental conditions. Varying the pH outside the operational range of enzymes also reduces the enzyme activity, and can ultimately lead to permanent denaturation. Therefore, food enzyme manufacturers are striving to produce enzymes that can operate in a wide temperature and pH range. The key players in the global food enzymes market include DowDuPont (US), Associated British Foods (UK), DSM (Netherlands), Novozymes (Denmark), and Chr. Hansen (Denmark), Brenntag Pte. (Germany), Kerry Group (Ireland), Jiangsu Boli Bioproducts (China), Biocatalysts (UK), Puratos Group (Belgium), Advanced Enzymes Technologies (India), Amano Enzyme (Japan), and Enzyme Development Corporation (US). 13.8 Jiangsu Boli Bioproducts Co. Ltd.
13.11 Advanced Enzyme Technologies Ltd.
13.14 Enmex, S.A. De C.V.